"traditional . tart . 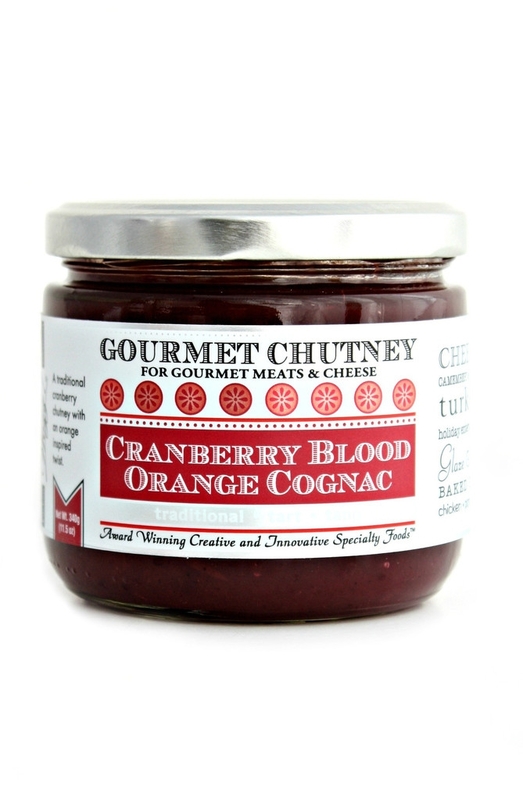 tang"
Our Cranberry Blood Orange Cognac Gourmet Chutney is a traditional cranberry chutney with an orange inspired twist. 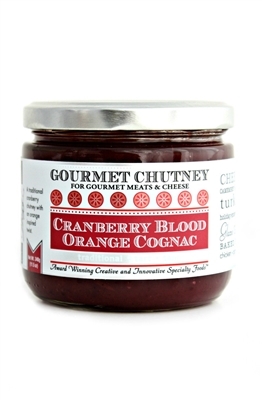 This gourmet cranberry sauce is bursting with fruit, tang and a hint of orange Cognac liquor. Made with New England cranberries, fresh orange, apples, raisins and spices, it makes a beautiful sauce perfect for all your white roasted meats, baked ham, and holiday favorites. 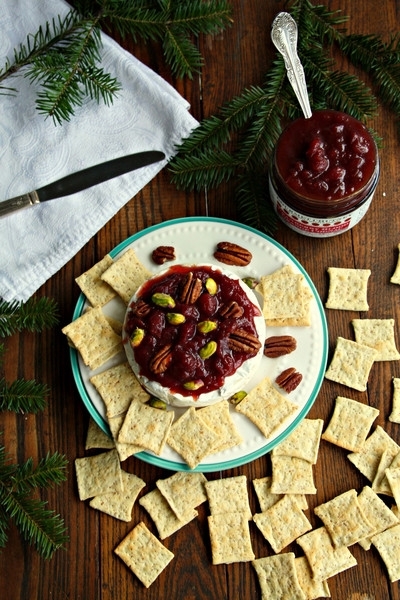 An elegant pairing for Camembert and Brie cheese and a holiday entertaining favorite. The perfect addition to any fall gourmet gift basket and cheese board. Always a first choice for a holiday themed gourmet gift basket, because it's just so easy to use. ✤ Cheese Plate: Pairs perfectly with ripe Brie, Camembert or goats cheeses. ✤ Side: Perfect for all your roasted white meats. ✤ Dressing: Spoon or toss through a salad of baby spinach, red onion, thin brie slices, avocado and candied walnuts. ✤ Sauce: sweet and sour chicken; Brown chicken with red onion and chopped garlic. Add 1 cup of apple juice, bring to a simmer and reduce by half. Finish with Cranberry Blood Orange Cognac Chutney, fresh basil. Serve with rice. 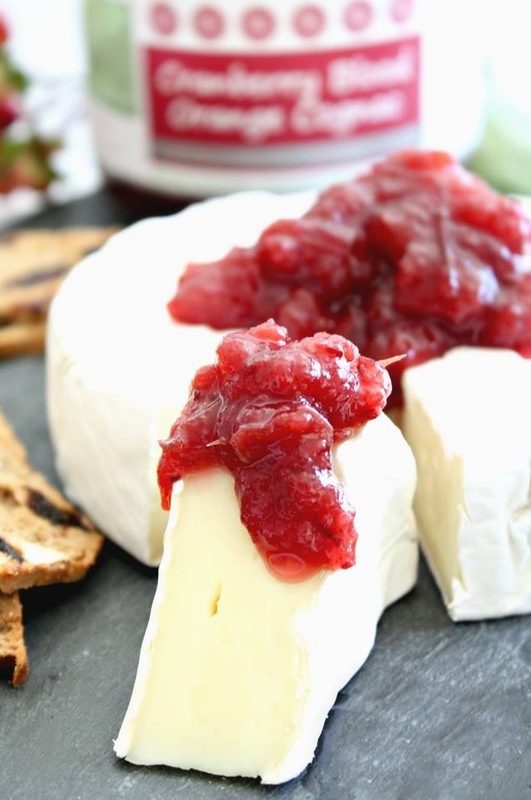 ✤ Glaze: Our cranberry orange chutney makes a delicious glaze for pork, turkey, chicken and baked Brie. Ingredients: Cranberries. Apples. Raisins. Orange Juice 100%. Cane Sugar. Blood Orange Pulp. Cognac-Orange liqueur. Orange zest. Cinnamon. Spices. Sea salt.